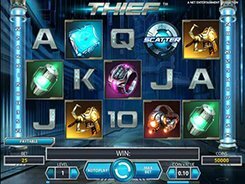 Thief is a NetEnt-powered slot that will take you to the future where thieves use high-tech gadgets to bypass the most advanced locking systems and break into bank strongrooms. 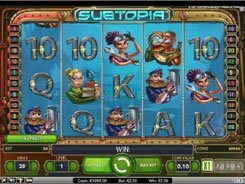 The slot has 5 reels, 25 fixed paylines, nicely designed futuristic symbols and generous features. 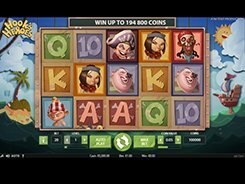 Before a spin you can adjust a coin value (up to $0.5), and the number of coins (up to 10), thus your spin bet can be anywhere from $0.25 to $125. The symbols set incorporates five Thief Tool symbols and five poker cards from 10 to Ace. The slot is equipped with two different scatter symbols. 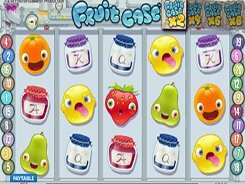 Three or more regular scatters unlock ten retriggerable free spins, while three or more Adrenaline scatters activate ten Adrenaline free spins. In the latter case, only the high-paying Thief Tool symbols appear which gives you a chance to win big. There is also the Diamond symbol that is reserved especially for Adrenaline free spins. 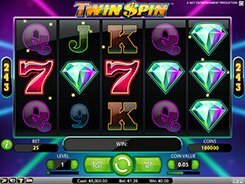 Hitting five Diamonds across a bet line pays out the slot’s jackpot worth $25,000. 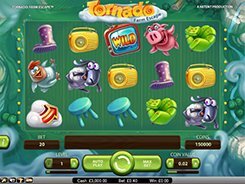 The slot has an expanding wild icon that appears on reels 2, 3 and 4 only and is used as a replacement for all non-feature symbols.